Floaty ruffles add to the ethereal charm of this Nicholas daisy-print blouse that's perfect for desk to dinner. Style with the Marci Shoulder Bag from kate spade new york. Red and black floral printed silk (100% Silk). Top. Long sleeves. V-neckline. Exposed front button down placket. 24" from shoulder to hemline. Imported. Cute top, great for the weekend. FIT: low cut - I have a longer torso and it still hit mid-chest for me, looks great but just particular look. Lightweight fabric, so great for ~60F weather. 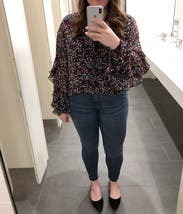 CONS: Weird one, but ruffles tend to get in the way -- e.g., I was out with a group of friends and kept finding my sleeves getting caught in the food if I reached for a chip / guac. 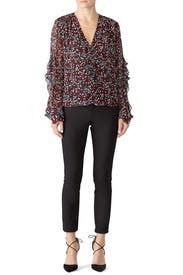 I love this blouse and the details on the sleeves. It is great for work, but also drinks after work. I got so many compliments. Could have potentially sized down, but I like my clothing a little looser. Wished I owned this top! Beautiful top! I have a long torso and pear shape so worked best tucked into a skirt or pants. Probably could've done with a 6 but worked it great. Sleeves are beautiful too! Rented this as part of my unlimited and was able to wear it twice in one weekend - once to work on a casual Friday and once to drinks Saturday night. It was fun, comfortable and on trend. I agree with the other reviewers that it needs something underneath because the V is very low - I wore a black camisole and it was perfect. I am petite and I found that the bottom of the shirt hit in a good spot - not too long at all. 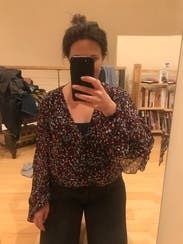 The sleeves are kind of poofy and ruffly but that is the style and I had no issues with it. 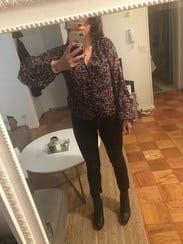 A fun rental when yuo want to try out a cute top for work or going out. I love this blouse. It is super flattering for both day and night. I'm an apple shape and it is loose enough around the middle to be flattering without looking like a tent. I don't typically go for arms with ruffles but the fabric on this is very thin and the ruffles hang in such a way that it is flattering. Really pretty blouse. Very low cut, needs a cami underneath otherwise nsfw. Looks great tucked into a pencil skirt for work . main problem is the depth of the V neck! 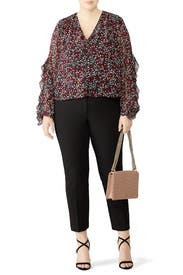 a lightweight blouse with pretty sleeves and pattern but it almost ran a little small - but the V neck is way too deep for me- perhaps a taller person with a longer neck would find it workable. Even with necklaces, it was too bare for me. 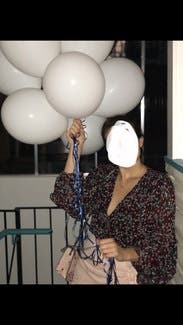 Wore this for a party-fit was true to size. Loved the details on the sleeves! I am getting compliments on this one! Nice fit. Pretty print. Attractive sleeves. Liking this one. I wore this shirt 3x during my rental. It was super cute and flowy and could be dressed up and also worn out for drinks. It's quite sheer so I wore a black tank underneath. 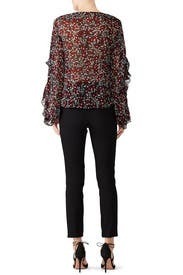 This top has very feminine details but there is no shape to it so the bottom is boxy and can be unflattering. I wore a leather jacket over it so you couldn't tell. The spaces between the buttons are completely open but they don't gape. This was an easy top to wear. Hated to give it up! Really cute for dinner and maybe drinks after. Fit really well. Had to wear a tank top underneath because it is seethrough. Typically wear a size cus or 0-2, and this shirt fit perfectly. 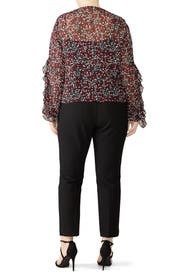 I­t­ was a great blouse for work (I'm working in a more causal environment) and I­t­ easily could be dressed up or down. Definitely would recommend renting I­t­! 6 fit more like a 4. Really pretty and feminine. I was very satisfied with this top! Very flowy and light. I am 23 weeks pregnant and it hid my bump. Comes very low so I styled with a black cami underneath. I plan to rent this over and over and over again. 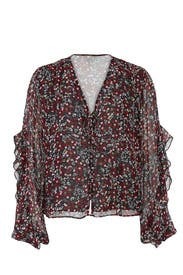 The sleeves have movement but aren't bulky - which for an athletic gal is ideal. Gorgeous pattern and color. Loads of complements. Definitely size down. I usually wear a 4 in all Nicholas tops but this one ran very big. Needed to return for a size 2. Otherwise, very cute and comfy. I love this top. Very lightweight but not sheer in the front! I wore this to work with a tank underneath and it was perfect. Extremely flattering and comfortable! Really cute, but see through in the back and VERY low cut. Fits loosely, but the shirt is short so I went with an 8 vs 6. It kept falling down a little showing my bra, but it was overall so fun and cute! The sleeves are great! This top was beautiful, well cut and I loved it. The v is pretty low so you may need a bandeaus underneath if you want to wear it to work. This was a very flattering top for me. However, I am not purchasing because I am not a fan of the material in general when it comes to my clothing preferences. 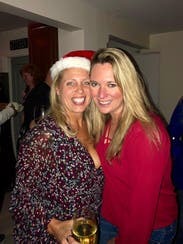 Low cut - definitely needs a camisole underneath. Beautiful buttons and details. Fun top! This shirt is really great. I love all of the button detailing and the flow-y sleeves. The only issue with it is it's slightly cropped almost. I had on high rise jeans and made it work but as someone who is large chested I had to go with the larger side to make sure it fit over the girls, so it was a bit of a game of making sure my navel wasn't showing and too much wasn't showing on top. Great top. Fits well. Tucks in nicely and lays well with high waisted pants/skirt. Nice fabric, lots of movement. This top was comfortable and cute. The fabric is a nice weight and lined in the front. There is a lot of movement. It's fun to wear. It hangs nicely and was flattering. Just the right length for me and I'm 6'0". I'd definitely rent it again. This shirt is super cute, and I got a lot of compliments on it all day at work. Very feminine and flowy. I would definitely recommend this shirt and will probably have to rent it again.